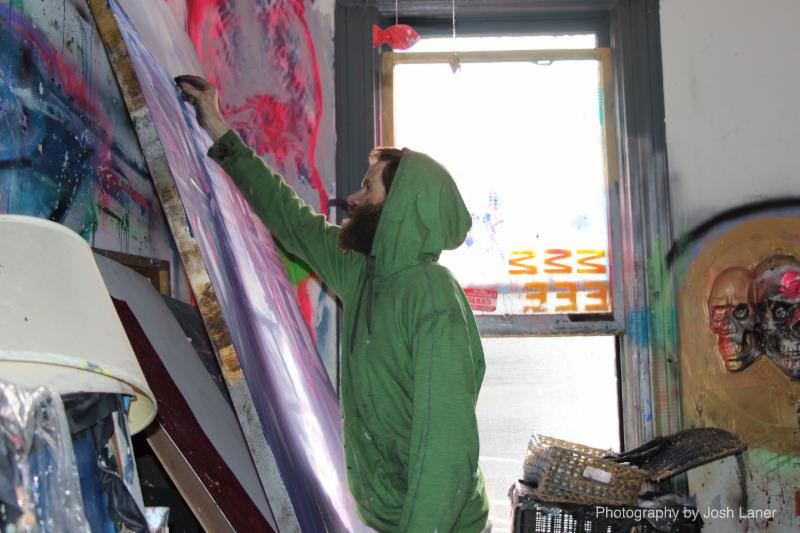 Ken Foster is a Vancouver street artist who has been compared to Vincent Van Gogh. A mentally ill man with a drug addiction he paints some truly amazing pictures at a prolific rate. Foster’s prolific rate of production is a matter of survival since he needs the money to buy food, supplies and his next fix. Charting Foster’s life over an 18 month period the film is a warts and all portrait of the man and his life. We see him painting, selling, and discussing his life. We also get to hear about the man from his family (Mother and daughter), friends, buyers and doctors. It’s a rough and raw portrait of a man somewhere past the edge. Everyone, including the man himself, would love Foster to be able to get clean and function but there are issues and problems, not the least of which is the fact that the antipsychotic drugs he’s on kill his ability to express himself creativity. That may not sound like a problem until you realize that for some people being able to create is everything. I’ve met several people over the years who have gone off their mental illness meds because they had to create and feel. While Foster’s life can be seen as being similar to Richard Hambleton who was profiled I the film SHADOW MAN, Foster is a much more an agreeable sort of fellow. He’s a nice guy and it’s clear why he has friends and family who care about him. This is a film that is a walk on a side of life most of us don’t know nor want to know the film reveals the work of a great talent. Director Josh Laner' does our appreciation for the man and the artist a huge favor by showing us as rounded a portrait as possible. The fact we see all sides of Foster makes us like him for who he genuinely is. It also rips our hearts out because we know he shouldn’t have to live that sort of a life. And then there is the art work. Fantastic portraits and stunning landscapes that delight the eye. That Foster turns them out with such ease is truly mind blowing. It kind of bogles the mind that he can create so much glorious art- that is something more than the typical factory art work of people like Thomas Kincade who use a style to just sell paintings without heart and soul. Foster’s art have a soul to them and an arresting quality. I love that Josh Laner shows us dozens and dozens of his paintings because while many are similar they are all unique. KEN FOSTER the film is a wonderful portrait of an artist. While it’s gritty you are there style is not going to be for everyone, for those who click with it are going to be thrilled… so thrilled they may try to make a trip to Vancouver to buy some of his art. KEN FOSTER is released on VOD and DVD Tuesday September 25.